Mobile, high-performance cordless battery-powered lawn mowers with robust polymer housing and 6-setting cutting height adjustment. Special high-lift blades ensure an attractive cutting pattern. 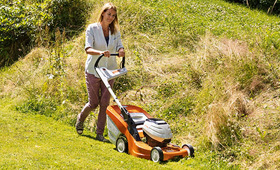 The battery also fits all other STIHL cordless machines.